An attractive Sunshine Valley town on the Crow’s Nest Highway, Grand Forks is named for its location near the convergence of the Kettle and Granby Rivers. Observation Mountain overlooks the town to the north and the aptly named Rattlesnake Mountain to the east. The beautiful tree-lined streets and abundance of well-maintained heritage homes are enchanting. Grand Forks has everything one could ask for in four-season recreation -fishing, hunting, hiking, biking, golfing, downhill skiing, cross-country skiing, camping, and all types of water sports on the many lakes and rivers. 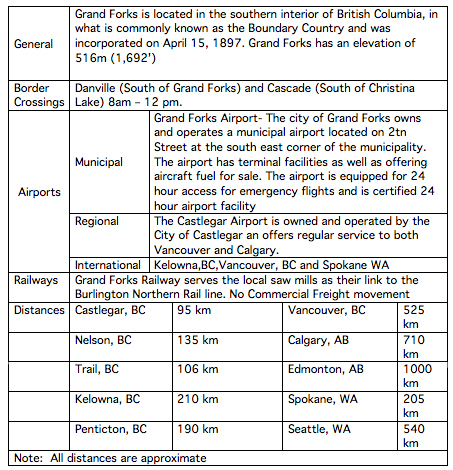 Grand Forks was an important railway centre with 5 railways, including two continental lines. Discovery of gold and silver in the North Fork Valley contributed to the wealth of the area, and the Union Mine came into being. Mining prosperity reigned for twenty years, augmented by the developing agriculture and fruit-growing industry. However, the decline of the copper market in 1919 forced the closure of the Phoenix Mines and the dismantling of the smelter, dealing a crippling blow to the entire district. There was little growth in the area until new industries such as seed growing, logging and sawmill operations all combined to return prosperity to the community. Grand Forks is the home of descendants of many of British Columbia’s Doukhobors, a pacifist group of political refugee emigrants from Russia that immigrated to Canada in 1899 and settled in the Grand Forks Valley in 1909. The pride and rich culture of the Doukhobors is prevalent in the valley, and Russian is still taught in schools. Grand Forks and the Boundary Country have its roots tied to the mining and railroad boom of the 1890s and early 1900s. The rich farmland attracted the first settlers. They stayed on through what is referred to as the industrial era that included the building of the three railroads, mines smelters and power plants. The mining slag piles, remnants of the smelter, can still be seen a short distance from town. The first lumber mill was built in 1895 by Ernest Spraggett. The first school, post office and hospital were also built in the mid 1890’s. The CPR built the first railroad in the Boundary Country in 1899. The Station, The oldest CPR station in BC still exists in its original location in West Grand Forks. Grand Forks got its name to represent the confluence of the Kettle and Granby Rivers. The population which started with a few farmers continued to grow. In 1896 the population was 200. By 1899 it had reached 1,000. Today the population is approximately 4,000 with area populations of over 10,000. Grand Fork’s economy today is based on the lumber industry with tourism playing a large part in its economic growth. There is a lot to do and experience in this great little town The mining and railway history, Doukhobor heritage and location in the Monashee Mountains at the junction of two rivers offers a wide range of activities. The rivers, grasslands, mountains, trail trail and provincial parks provide a backdrop for golf, hiking, mountain biking, swimming, tubing, canoeing and kayaking, fishing and camping. Driving routes take in historic sites, farms and orchards while downtown walking tours showcase the arts and more heritage sites. The Trans Canada Trail passes through Grand Forks on the rail bed of the Columbia & Western Railway (a CPR subsidiary), which ran from Castlegar in the Kootenay Rockies to Midway where it connected with the Kettle Valley Railway. There are numerous access points in Grand Forks with parking areas at North Fork Road and next to the Grand Forks Station Neighbourhood Pub on Donaldson Avenue. The pub occupies the oldest CPR station in BC still in its original location. Riders are welcome. A popular day trip starts at Eholt station, a former divisional point, now abandoned, 22km/13.7mi west of Grand Forks. Ride downhill through heavily forested backcountry and stop to take in the views when the trail swings south and skirts the valley of the Granby River. Pass through two tunnels on the way into Grand Forks. Shuttle service is available through Chain Reaction, a bike sales, service and rental outlet. Long-distance riders head to Christina Lake, 21km/13mi east of Grand Forks. The trail follows the narrow Kettle River Valley and crosses the impressively engineered Kettle River Trestle. Ride into town for food and lodgings. The 86km/53mi round trip to Greenwood makes an excellent overnight ride. The trail skirts the Granby River Valley before turning west to cross the 1028m/3373ft Eholt Summit and descend into historic Greenwood. The former smelter boomtown retains tremendous character in its well-preserved heritage buildings. Greenwood served as a set for the movie Snow Falling on Cedars. Restaurants and lodgings available. Another Grand Forks rail trail is the Vancouver, Victoria & Eastern, part of the Grand Trunk system, a direct competitor to the CPR in the great days of rail. A popular hiking trail, it is also possible to ride. Take the easy 6km/3.7mi out-and-back Spencer Hill route to the west from the Reservoir Road trailhead. Ride across grasslands with views of the valley and wildflowers in season. The ride east is moderate, with similar views and a round trip of 6km/3.7mi. Novice to intermediate riders check out the 5km/3mi single track up and down Papa Harpold trail with 590m/1936ft of elevation gain and a great view at the top. Locals describe Fisherman Creek as a lung-buster with 540m/ 1772ft of elevation gain and a predictably steep downhill. Saddle Lake is another ride for improving climbing skills and cardio fitness. A combination of single and double track, it reaches a lookout point with a full view of Grand Forks. On the downhill, swing through the switchbacks and consider taking an alternate route along the VV&E rail grade. Bundschuh is a 16km/10mi out-and-back trail for intermediate riders. The combination of single and double track passes an old homestead and cattle coral. Intermediate or advanced freeriders check out the Ripper. This continuous downhill tests skills with log rides, skinnies and stunts. At the bottom it runs into Harpold, which also offers some installs, although these may be tough to find without a local guide. Stop by Chain Reaction for rentals, maps and insider info on all the local trails. Maps are also available at the Grand Forks Visitor Centre, 524 Central Avenue (Hwy 3) in the heritage courthouse.